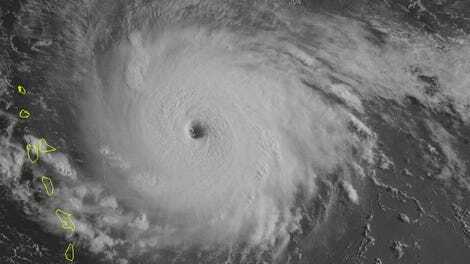 Category 5 Hurricane Irma is currently barreling through the Atlantic Ocean and is now considered the strongest recorded storm in the Atlantic basin outside of the Caribbean Sea or Gulf of Mexico, the Weather Channel reported Tuesday night. “I am at a complete and utter loss for words looking at Irma’s appearance on satellite imagery,” National Hurricane Center Storm Surge Unit senior scientist Taylor Trogdon tweeted. The storm is currently closing in on the island of Barbuda and has reached at least 185 miles per hour (298 kilometers per hour) wind strength, per the Weather Channel. It was currently less than 80 miles (128 km) from the Leeward Islands as of around 10:15pm ET, and continuing to move west at approximately 10 to 15 mph (16 to 24 km/h). “The only hurricane anywhere in the Atlantic ever known to have stronger winds was Allen (1980), at 190 mph” (305 km/h), Weather Underground wrote. 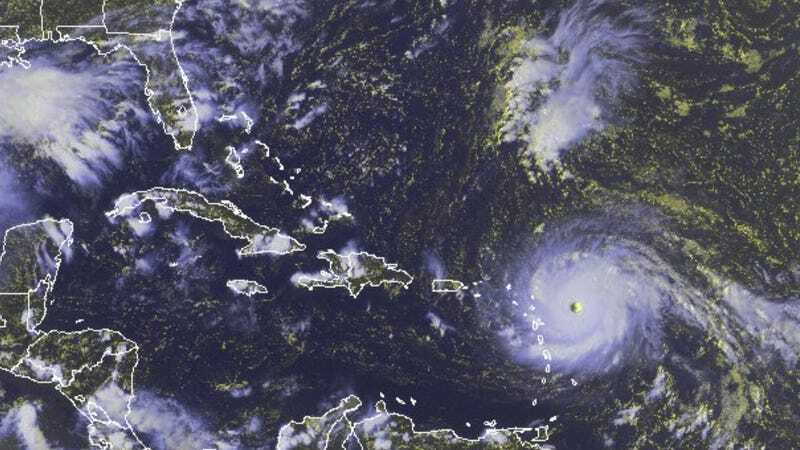 According to Weather Underground, its trajectory is set to take it “near or just between Antigua and Barbuda during the predawn hours Wednesday”; it will subsequently pass St. Kitts and Nevis, Anguilla, St. Barthelemy and the British Virgin Islands. Later, it will “rake Puerto Rico, the Dominican Republic, Haiti and Cuba,” the Guardian wrote, before it could possibly curve north and strike parts of southern Florida this weekend. Per CNN, Irma has sent residents in the path of the storm from the Caribbean to Florida scurrying to move boats to land, reinforce residences and scour stores for supplies. A state of emergency was declared in Florida, Puerto Rico and the US Virgin Islands, while Florida Gov. Rick Scott said 7,000 National Guard troops had been ordered to deploy by Friday. Irma is the second devastating hurricane in the Atlantic in just a few weeks. In August, Hurricane Harvey slammed into southeast Texas, killing at least 50 people, displacing an estimated million other and damaging at least 200,000 homes in a rampage which may reach $180 billion in damage. Update 1:17am ET: Per the New York Times, winds from Irma have already began to pummel Antigua and Barbuda early on Wednesday morning. Authorities cut off power, “forcing residents to listen to the latest forecasts on transistor radios in the darkness,” and locals crammed into nearly 40 shelters on Antigua under fear their homes would blow down. According to the Weather Channel, Irma’s eyewall—the massive vortex which surrounds the calm eye of a hurricane—has slammed into Barbuda, with “sustained winds of 93 knots or 107 mph” (172 km/h). Gusts are reaching 131 mph (210 km/h).